Wheelchair access ramps are located on the north side (Langdon Street) and on the east side (facing Library Mall) of the building. For more information, see the Society accessibility map below or the University of Wisconsin accessibility map. 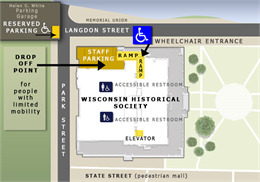 The Wisconsin Historical Society headquarters building is fully accessible by wheelchair. Read more information below about the accessibility of the building and the services provided to visitors with disabilities. Most "library stack" floor levels must be accessed by stairs or an elevator that is not wheelchair accessible. Please request assistance from the Circulation Desk (2nd Floor) for retrieval of materials from inaccessible floors or shelves. A magnifying reader is located in the Library Reading Room (2nd floor). Also, magnifying glasses are available at the Information Desks in the Archives (4th floor), Library Reading Room (2nd floor), and Microforms Room (2nd floor). Staff are available to assist people with limited vision and will help by reading materials or finding items in the stacks. Staff cannot provide extended or regular service. Visitors with limited mobility may be dropped off and picked up in the small staff parking lot on the corner of Park and Langdon Streets. On-street metered parking is available, but very limited, near the Society. The closest available parking for visitors with limited mobility is located in UW Lot #6, the parking garage under the Helen C. White Library on the northwest corner of Observatory Drive and North Park Street. Enter the garage from North Park Street. Some meters are available during the day. More meters are available after 5 pm and on Saturdays. 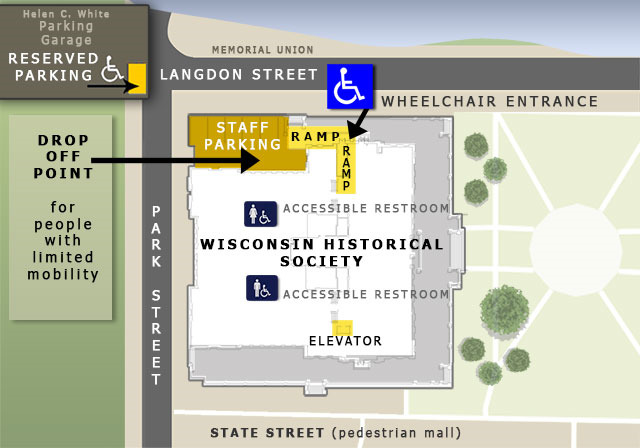 Parking for people with limited mobility is also available on the ground floor of the State Street Campus Garage (also known as the Lake Street Ramp), located on Lake Street between State Street and University Avenue. See more information about the accessibility of City of Madison parking garages. For both UW and City of Madison garages, you'll park for free and have no time restrictions if you display a valid, state-issued DIS hangtag or DIS license plate. (Free parking ONLY applies when parking at a meter with a time limit of 30 minutes or longer.) See more information about general parking and transportation options. NOTE: The Memorial Union construction project may disrupt traffic and some parking options. See the current UW campus street closures and detours map. The Society's public computers and photocopiers in the Library Reading Room are wheelchair accessible. Library users who have physical difficulty retrieving items from the book stacks may request that library staff retrieve specific items for them. Place your request at the Circulation Desk on the 2nd floor. Items will be retrieved hourly, or as time permits. Advance requests are encouraged. Contact the Circulation Desk at 608-264-6534 or email us. Service animals are permitted for persons with disabilities in accordance with the Americans with Disabilities Act.